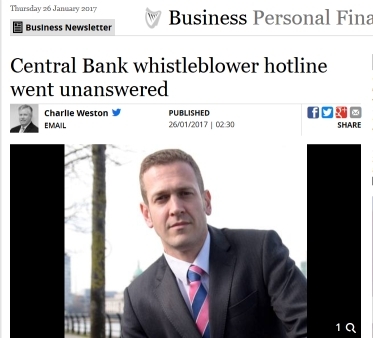 We were asked to comment on a finding by Charlie Weston in the Independent about the fact that the private disclosure (or ‘whistle-blower’) lines in the Central Bank don’t work. After the newspaper highlighted this they took action, but we were not impressed that this was only found out through the work of a journalist. The comment we offered was very clear (below).